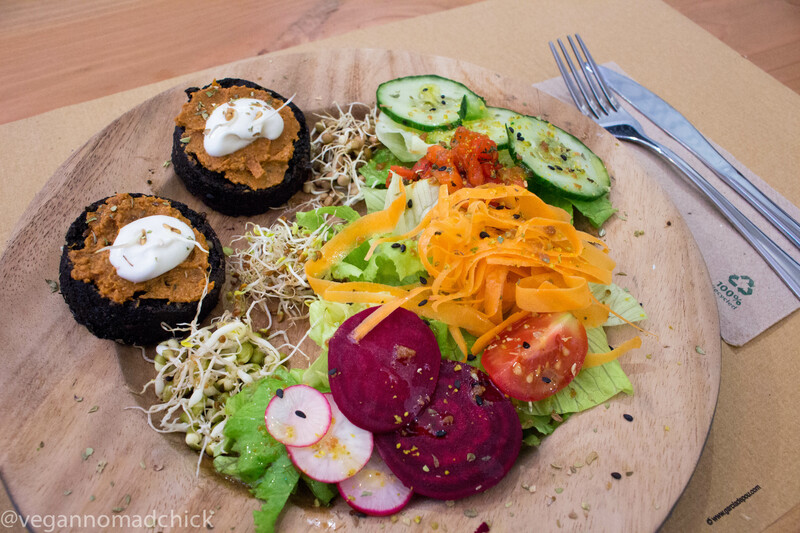 Petit brot: 100% organic raw vegan café in Barcelona. Barcelona is hailed as a vegan paradise because many restaurants here offer vegan options. 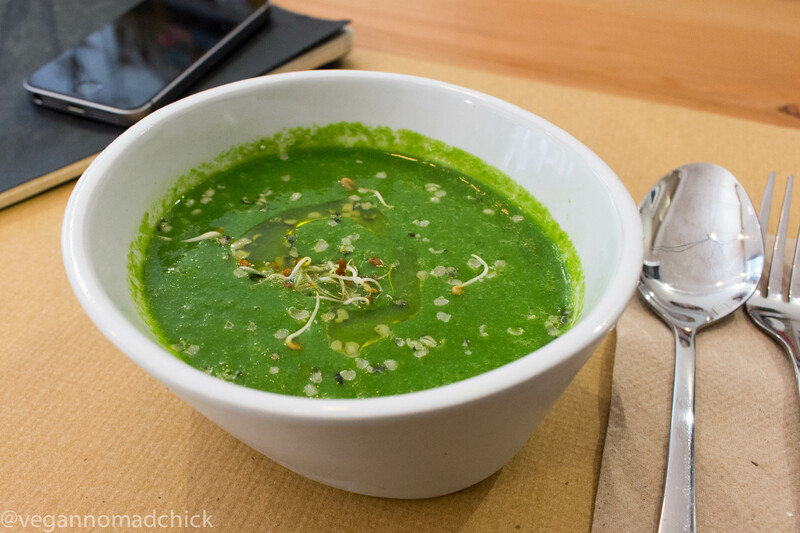 At this time, HappyCow lists 124 vegan and vegetarian-friendly restaurants in Barcelona. If you can afford to eat out often, you’d never get bored! 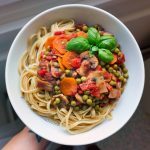 I can’t try many of these places because of my budget and more importantly, most vegan options at restaurants are decidedly not HCLF-friendly. On the contrary, they tend to be high in fat and too processed for my liking. Also, the portions are much smaller than I’m used to! Today I had lunch at Petit Brot, an entirely organic and raw vegan café located a few blocks from La Rambla, close to La Boqueria Market. Petit Brot is primarily a juice and smoothie bar but they serve breakfast, brunch, and a daily menu every day. They even offer grab-and-go portions of raw crackers, hummus, pâtés, desserts, and almond milk. I ordered their menú del día which included a soup, entree, and dessert for €15.95. This sounds expensive but it’s reasonably priced considering everything is organic, hand-made, and fresh. Today’s soup was a chilled green soup: blended kale, cucumber, celery, spinach, avocado and a little garlic, topped with sprouts, hemp seed, and a drizzle of oil. I’ve never been a chilled soup person but I liked this one! Imagine a green smoothie but savoury instead of sweet. It was refreshing on a hot day like today. For my entree, I had a choice between pesto zucchini noodles or wee burger patties, so I opted for the patties since I’ve never had raw burgers before. These were tasty but not something I could eat every day. I’d rather eat more salad, to be honest! The patties were mainly comprised of mushrooms and dehydrated for 12 hours or so. They came topped with a sundried tomato pâté and a dollop of cashew cream. The sundried tomato pâté and cashew cream were the tastiest bits besides the trio of sprouts (all grown in-house, naturally). I chose carrot cake for my dessert. It was delicious! Other options were chia pudding cups or energy balls. 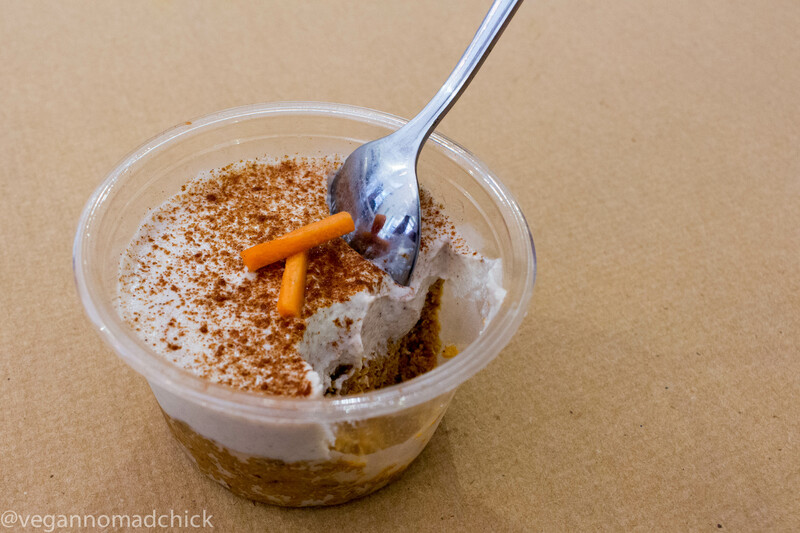 Desserts come in wee pots perfect for a to-go snack. Petit Brot only uses compostable food containers, so don’t worry about the plastic! The food was tasty and the owners were super friendly and helpful. They even suggested I visit the organic shop down the street for good watermelon because I told them I’ve been struggling to find decent ones. Now I know to look for Veritas shops when I’m out and about! I plan on revisiting Petit Brot but next time I’ll stick to a smoothie or juice in lieu of a meal. I enjoyed the food (especially the carrot cake!) but don’t want to eat foods like this every day. Do you like raw foods? Have you eaten at a raw restaurant before? Ooohhh, Petit Brot <3 I love this place and the owners. I am from Barcelona, so we have been there few times. I also love Väcka and Cafè Blue Project, both with lots of raw vegan options, smoothies and juices in Barcelona too. In London I have been to Nama, Campbell's Canal Cafe (formed Inspiral) and Wild Food Cafe. These type of places are my favourite! The smell, the colours and the taste… make me happy, no other cafes or restaurants can be compared! Have you been to any of these places or others? Oh awesome! Petit Brot was so nice. I haven’t tried the other places you mentioned, but I would love to some day! The only other raw places I tried were in Berlin. One was called Rawtastic (https://lisalansing.com/2016/06/02/day-4-in-berlin-im-getting-used-to-this/) and the other Daluma (https://lisalansing.com/2016/06/06/my-first-week-in-berlin-a-visit-to-the-reichstag-and-daluma/). Rawtastic was 100% raw and my favourite, Daluma isn’t all raw but they had lots of raw stuff. Also The Bowl in Berlin had a few raw options, but I only got smoothies there. 🙂 I find most raw meals in restaurants too fatty for me, but something like wraps or salads are very nice! !